Matt is teamed with his former partner Tina to thwart Operation Fallout, a nefarious plot to detonate nuclear bombs at Alamagordo and set off a war between the U.S. and Russia. The two spies are sent to Phoenix to retrieve a computer tape from operative Sarita, who works as the featured attraction at the Slayboy Club. Sarita is assassinated onstage, and the tape winds up in the hands of beautiful but klutzy Gail Hendricks. Matt thinks she’s an enemy agent, and they make their way to San Juan, where they’re captured. Tina turns out to be a double agent, and Matt must battle the odds inside Big O headquarters to stop Operation Fallout and defeat evil leader Tung Tze. All this serves as an excuse to surround Dino with gorgeous women and make with the double entendres in his smooth as Bourbon voice. Dean’s basically playing himself here, or at least his public image of a fun-loving, skirt chasing, boozy lounge lizard. His easygoing charm makes it work, and he has a ball as the ring-a-ding spy. Dean can be heard singing on the soundtrack whenever he’s thinking of girls, and there’s a funny moment when, while driving with Gail, Frank Sinatra comes on the radio crooning “Come Fly With Me”. “Oh, turn him off”, says Dean, “He’s terrible”. He switches the station and Dean himself is on singing his own hit “Everybody Loves Somebody Sometimes”. Martin smiles and says, “Now that guy can sing!”. All the women are appropriately attractive. 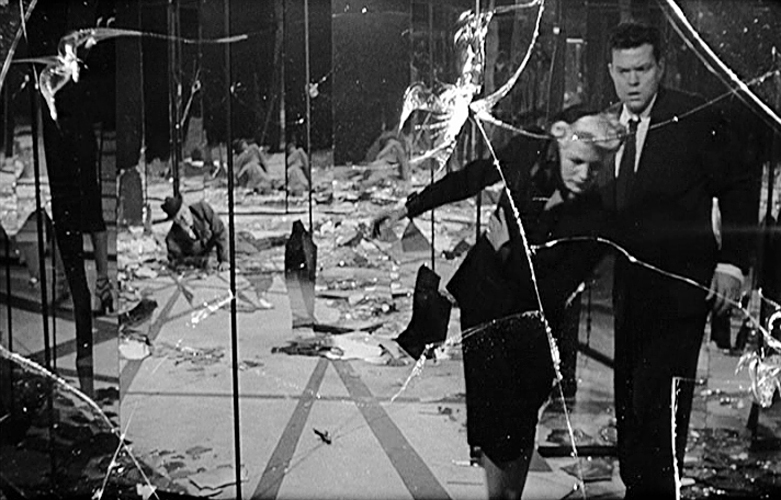 Stella Stevens is the graceless Gail, an innocent caught up in the sinister skullduggery. She give a fine comic performance, and can take a slapstick pratfall with the best of them. A former Playmate of the Month, Stella’s seen to best advantage in the films THE NUTTY PROFESSOR (with Dean’s ex-partner Jerry Lewis), Sam Peckinpah’s THE BALLAD OF CABLE HOGUE, and Irwin Allen’s THE POSEIDON ADVENTURE. Daliah Lavi (Tina) was an Israeli actress featured in the spy spoofs THE SPY WITH A COLD NOSE and 1967’s CASINO ROYALE, as well as Mario Bava’s THE WHIP AND THE BODY. Beverly Adams (Lovey Kravezit) was in HOW TO STUFF A WILD BIKINI, but was best known as the wife of celebrity hairstylist Vidal Sassoon. 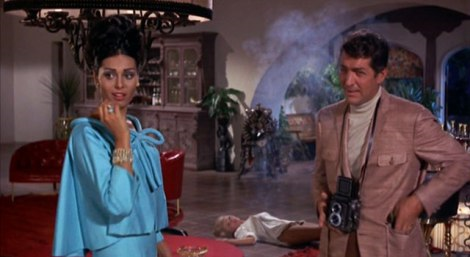 Nancy Kovack appears as counterspy Barbara, who tries unsuccessfully to knock off Helm. Kovack was a 60’s staple who acted in countless TV shows of the era (MAN FROM UNCLE, STAR TREK, BATMAN, etc), and played the ingénue in JASON AND THE ARGONAUTS and THE OUTLAWS IS COMING (The Three Stooges’ last feature), and retired from films after marrying conductor Zubin Mehta . Cyd Charisse gets “Guest Star” billing as Sarita, the dancing spy. The former MGM musical star gets to strut her stuff once again in both the movie’s opening credits (where she does a striptease number) and onstage at the Slayboy Club (her vocals are dubbed by singer Vicki Carr). It’s basically a cameo role, but it’s good to see the leggy Miss Charisse dancing onscreen again. The males are all Familiar Faces to movie fans, composed of a fine set of 60’s character actors. 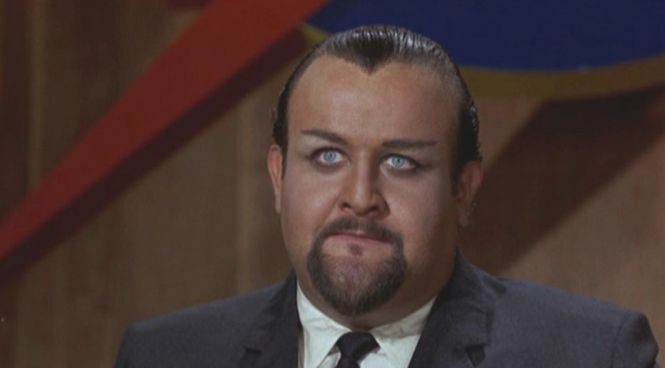 Victor Buono plays villain Tung Tze, and though he’s about as Oriental as Dino, he’s always a welcome presence. Gruff James Gregory is ICE chief MacDonald, and Robert Webber , Roger C. Carmel, and Arthur O’Connell are various Big O bad guys. Director Phil Karlson, known for his tough films like KANSAS CITY CONFIDENTIAL and THE PHENIX CITY STORY , shows his lighter side in this one and balances the comedy and action well. Producer Irving Allen was once the partner of Albert “Cubby” Broccoli, who broke up when Cubby decided to bring James Bond to the silver screen. Allen wasn’t interested, and missed the boat on a franchise that’s still going strong today. After seeing the success of the Bond films, Allen jumped on the bandwagon and obtained the rights to the Matt Helm novels, adding more comedy to the mix. THE SILENCERS and its sequel MURDERER’S ROW were box-office hits, but the final two (THE AMBUSHERS and THE WRECKING CREW) didn’t do so hot, as the spy craze was ending. Martin declined to do a fifth (THE RAVAGERS) and Matt Helm went into retirement. Attempts to revive the character have failed, including a weekly TV series starring Tony Franciosa. 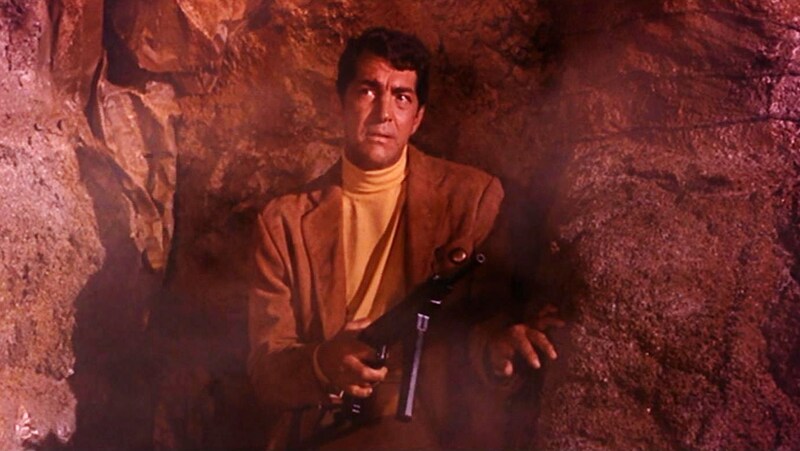 The Matt Helm movies are a product of their era, with Dean Martin’s breezy style carrying the load. All the wink-and-a-nod sexual innuendoes seem innocent in today’s anything goes world, but the Matt Helm series is worth watching as artifacts of a time past, no classics but still entertaining. I watch this movie only for Dahlia Lavi. When I was a kid I thought this was a pretty cool movie but now I can’t watch it without cringing. It is pretty cringeworthy today. 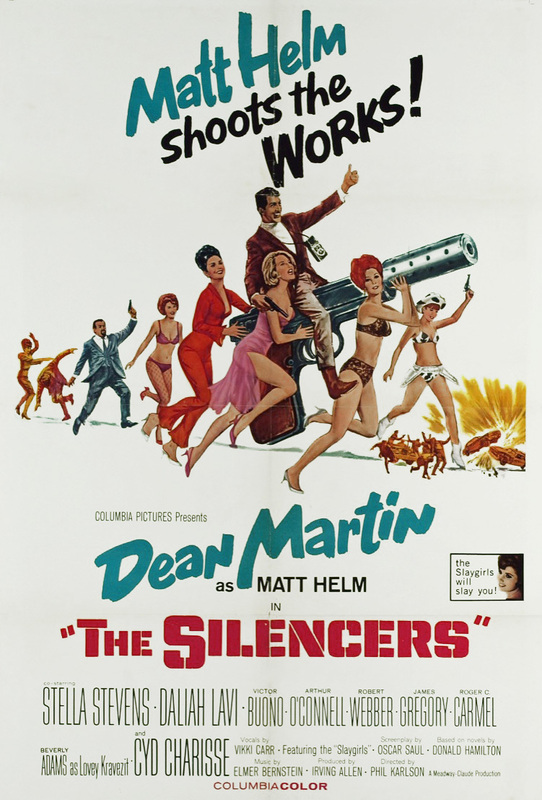 Mr. Loggins , this is one of the bestest of best remarkable reviews of our Dino as Matt Helm in “The Silencers.” The patter is perfect and the screen caps sensational! Never was, never will be anyone as cool as the King of Cool…oh, to return to the days when Dino walked the earth. Know that your rave reflections have been shared with day at ilovedinomartin…just so so sorry that it has taken us so long to find and share your wonderfully wise words ’bout our main man! Thanks, glad you dug it, and thanks for the reblog!